The two National Parks in Southern Patagonia, the Towers of Paine (Torres del Paine) of Southernmost Chile close to Cape Horn, and the nearby Park of the Glaciers (Parque de los Glaciares, and Fitz Roy Massiff) in Southern Argentina, offer some of the most spectacular trekking on the planet! The highlight of these beautiful and scenic wonders are their breathtaking granite monoliths jutting out of the Patagonian Plateau, symphony of glaciated towers, rugged horns, and monstrous fortresses, some with faces rising more than 6,000 vertical feet from the plateau below. On this trek we will circumnavigate these magnificent formations, among the most famous of exotic destinations for the world’s most accomplished alpinists, crossing panoramic mountain passes alongside the tremendous expanse of the Southern Patagonian Icefield, hiking across windswept plains with dramatic, riveting backdrops, ascending through dwarf beech (lenga) forests, winding past glacier fed turquiose lakes, to the base of the towering vertical walls. An impression you will never ever forget. Most of the trek we will enjoy the freedom of daypacks as packhorses carry our heavier gear. We have designed variations of this trip due to the region’s rugged and unique character and extreme changeable weather conditions the area is noted for, adjusting distance and destinations of the trek for different experience and comfort levels. Most of the treks require moderate hiking experience and the ability to participate and enjoy the adventure of a lifetime, camping in unpredicatable weather conditions and spectacular beauty, enjoying the hospitality of the local people and the exoticness of the native wildlife, The Nandu (Ostrich family), The Guanaco (Alpaca family), and a variety of colorful geese, duck, swans, woodland birds and raptors, not to mention the famous Andean Condor. There are many ranches and orchards homesteaded in this region and we will have opportunities to enjoy the warmth of the local inhabitants who have pioneered and braved this rugged climate and magic land for many years. Fly to Punta Arenas via Santiago, Chile. We meet you at the hotel, where we check your gear and have a short briefing. At dinner you will have the chance to taste delicious Patagonian dishes, and the best of Chilean wines. Drive to Towers of Paine National Park, crossing the Patagonian Pampas. After entering the park, our vehicle drops us at Hosteria Las Torres, where we enjoy a snack and begin our trek into the Paine mountains. We will be carrying light day packs while horses carry our gear up the Ascencio Valley to our Torres Camp. Hike to Valle del Silencio (Silence Valley), a special treat! We follow an almost unknown trail that climbs to the source of the Ascencio River. Surrounded by dense rain forest, the trail ascends this vast hidden valley. Here we can admire the sight of the mythical granite spires of Escudo (the Shield), Fortaleza (the Fortress), and the Towers of Paine. Morning hike to Mirador de las Torres (Overlook of the Towers), where we will have an incredible panoramic view of glaciers and the Paine Towers, reflected on the lake below. Hike back to Refugio Las Torres, to spend the night in this cozy Patagonian hut, enjoy showers, rest, and homecooking. A vehicle drops us at Pudeto, where we take the ferry boat across the turquoise waters of Lake Pehoe to our next point, Refugio Pehoe. After a snack we continue our hike through Circuito Chico (little circuit) towards Italian Camp, the entrance to the Valle del Frances (the French Valley). Day hike to Valle del Frances. As we head deeper into the valley we are welcomed by the breathtaking forms of granite pinnacles such as Los Cuernos (the Horns), La Hoja (the Leaf), La Espada (the Sword), and La Mascara (the Mask).The glaciated beauty of Paine Grande will astound you with thunderous sounds of massive chunks of ice falling from its heights. Return to Refugio Pehoe. In the afternoon we will follow the trail to Lake Grey, rewarded by the striking views of the Grey Glacier calving into its waters. In the distant background you will see the tremendous Southern Patagonian Icefield. Return to the Refugio Pehoe hut to enjoy a well deserved rest. From Pehoe, we return to Pudeto on board the ferry, where a vehicle awaits us. We will drive out of the park to Puerto Natales, where we spend the night at a hotel and have a nice dinner before departing for the Fitzroy massiff trip. Drive to Chalten, Argentina. 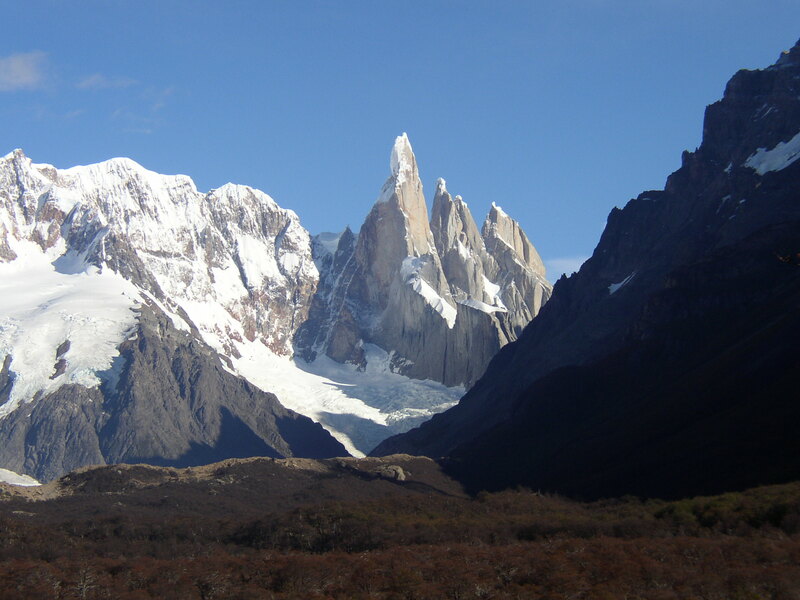 We will spend the night in Chalten, the gateway to the Fitzroy massiff, another amazing patagonian paradise. Hike to Bridwell Camp, spectacular and pleasant hiking leading us to the base of Cerro Torre, one of the most spectacular mountains on the planet. Horses carry our gear, while we hike with day packs. Hike to and spend the day on the Torre Glacier. 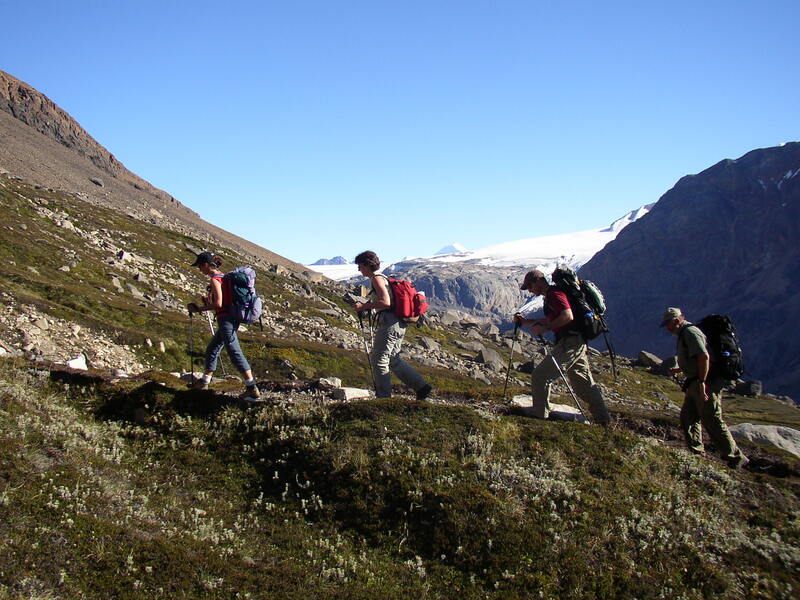 We will hike on the glacier, exploring the fascinating world of glaciers. Move camp to Poincenot Camp, in the Fitzroy area, spectacular hiking with impressive views of Fitzroy. On a sunny day we can swim in one of the lakes we encounter on the hike. Hike towards Fitzroy and Laguna de los Tres. Move camp to Los Troncos. We step out of the Park to a less visited area, where we have very unique and impressive views of the back side of the Fitzroy massiff. Los Troncos is like stepping into Snow White and the seven dwarves house in the woods, where little cabins and homemade meals await us. Hike towards Guillaumet, a beautiful rock spire in the Fitzroy Massiff. Pleasant steep hiking takes us to the Upper Glacier where we can admire the Southern Patagonia Icefield. Our hike out to Chalten. We pack our horses for the last time and hike out to Chalten. Drive back to Punta Arenas. Celebration Dinner and end of the Expedition. Fly back to Santiago. Connect with your flight home or continue traveling in South America.